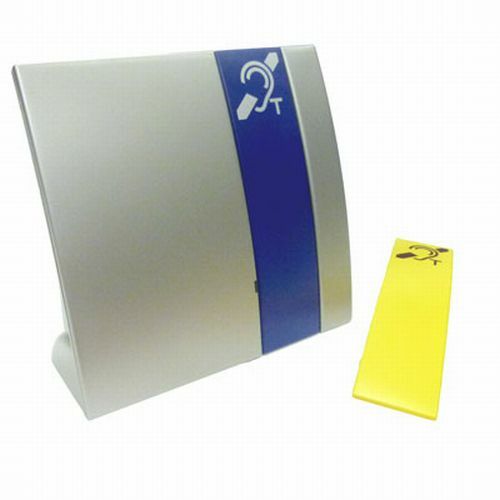 It's vital that in noisy situations hearing aid users can still hear what's being said, especially in important settings such as banks and hospitals.The Sarabec LA90 Portable Loop System is a convenient device designed for hearing aid users to listen more easily to conversation, especially in noisy situations. A built in microphone within the Sarabec LA90 picks up the sound of the person needing to be heard and transmits this in a loop system to the hearing aid user who will have their aid set to the 'T' position – they will also see a confidence light on the front of the unit to show them the system is operating. The speaker will see an indication of their voice being transmitted. This enables both speaker and receiver to speak with the confidence that the loop system is working, facilitating natural conversation,. Additional microphones can also be used with the Sarabec LA90 to further enhance the speech of the speaker – the loop system transmits a signal both ways so both individuals can receive it equally well.